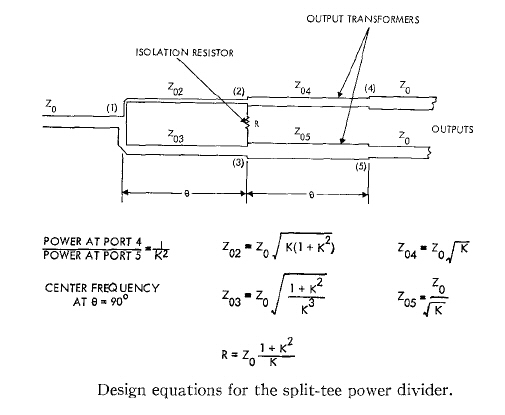 The original unequal-split Wilkinson article is entitled Split Tee Power Divider, by Parad and Moynihan, published in IEEE Transactions on Microwave Theory and Techniques in January, 1965. 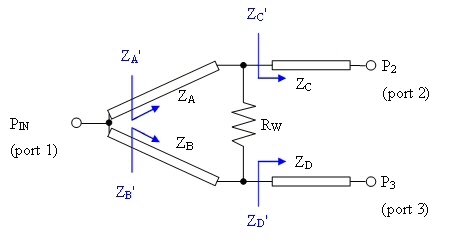 This article has been referenced in many subsequent works, including Harlan Howe's Stripline Circuit Design and Pozar's Microwave Engineering. In the article, Parad and Moynihan develop a singular set of equations for two unequal splitters. The simpler one is shown below (the second one adds an input transformer). For now, we will reanalyze the simpler one here. The ZC' and ZD' are set such that their geometric mean is equal to Z0. 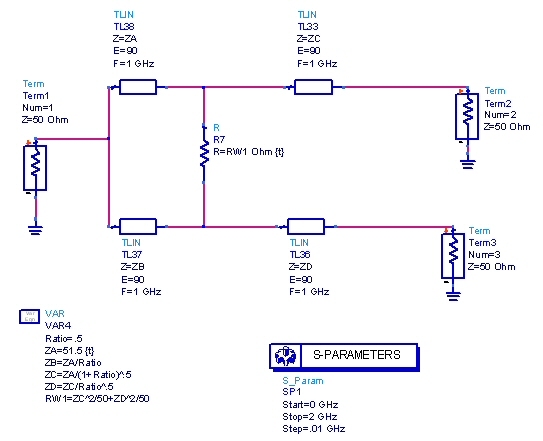 This minimizes the impedance transformation ratios for a given power split and thus maximizes the bandwidth. Note: there is some confusion on this page about the definition of the power split. The way Parad and Moynihan defined it, the ratio of power delivered to port 2 to power delivered to port 3 is 1/K^2. Later, we might define this differently, so pay attention... we'll try to clean this all up one day! 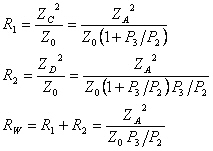 The above equations are used in the Microwaves101 unequal-split Wilkinson on-line calculator, and have been used by thousands of engineers for over 40 years. Taking a fresh look at the problem, we have found just three equations that must be satisfied for the four unknown impedances, which reveals that there is a degree of freedom that has been ignored for the past 43 years. The solution that Parad and Moynihan chose provides good bandwidth, but bandwidth could perhaps be traded for more realizable impedances, and design engineers should make that choice themselves. Finally, we need to calculate the load resistor. 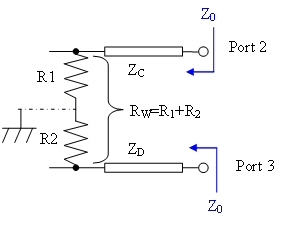 This can be done easily by noting that in the odd mode, power incident into port 2 must see impedance matched to Z0 and power incident into port 3 must also see impedance matched to Z0 (see figure). With (6) and (7) our solution to the unequal split Wilkinson is complete. 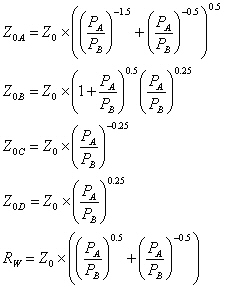 Now we can look at the impedance values when we choose different values of ZA. 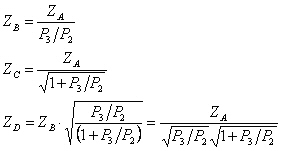 Let's look at a divider that splits two thirds energy to port 2, and one third to port 3 (P3/P2=0.5, see table below). Parad and Moynihan's results are ZA=51.5 ohms (shown in bold). Here the impedance for ZB is very high (103 ohms). By moving to ZA=40 ohms, the impedance range of the four lines is now 32.7 to 80 ohms, which may be more realizable in microstrip applications. What does this do to the frequency response? Below is a model of the splitter in ADS. We used this to look at the effects of varying ZA but maintaining a fixed power split. The equations in the "VAR" block are valid versions of the solution we have just provided. In this case, "ratio" is the ratio of power at port 3 to power at port 2, so "ratio=0.5" means that port 2 is favored with twice the power as port 3. Let's look at the response as ZA is varied. The center column of the figure below represents Parad's and Moynihan's solution, for a power divider where P3/P2 is 0.5 (ZA=51.5 ohms). Beside it are plots of the same power split but with PA=40 ohms, and PA=60 ohms. The markers shows that the power split is maintained. Click on an image to zoom in on it. Before we get much further, we want to point out one thing. For equations for solving the line impedances of an unequal splitter, you'd expect that for P3/P2 =x and P3/P2=1/x, you should have the same solution, only "flipped", right? If you use Parad and Moynihan's equations, this is what happens. For other solutions, this is something to watch out for (including the one below). Incorporating the maximally-flat impedance transformation to determine the section impedances provide for superior input match compared to Parad and Moynihan's solution. The exact solution to maximally-flat impedance transformer is not easy to solve, except in the case where the transformer only has two sections. Unfortunately the dog ate this part of our homework, but when it is completed the unequal/max flat divider design will appear on this page. Stay tuned!